Renovated, immaculately presented and spotlessly clean with stylish and tasteful high quality furnishings, fittings and lighting, including a designer fully equipped kitchen and modern bathroom. Two wool carpeted bedrooms (one with a queen bed with NEW Sealy Posture-Pedic mattress and base, the other with 2 single beds), brand new tasteful contemporary furniture, fully equipped with large 32inch/80cm HD LED flat wide-screen Digital TV, DVD, Stereo CD/radio, I-pod dock connects to Hi-Fi system and also digital TV. Binoculars, reverse cycle air-conditioner, dishwasher, fridge, microwave, F/L washing machine, Sheridan Designer linen & Sheridan towels. Beach towels are also provided. There is a Weber 'Q' BBQ on balcony. A large sliding double glass door opens out directly on to a large balcony, complete with outdoor furniture, new Weber Barbeque and fantastic ocean views. Sit back and watch the surfers, yachts, passing ships and the glorious sunsets, while enjoying a relaxing sundowner. It is is an easy and pleasant 8 to 10 minute stroll, along the foreshore pathway, to the main beach side hotels, cafes, restaurants and shopping. 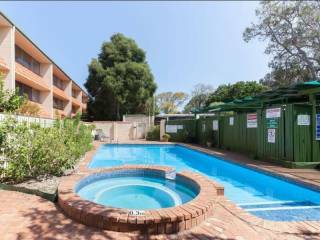 The apartment is close enough for convenience to these amenities, but far enough away , in the quiet residential area of South Cott beach, not to be disturbed by any noise or disturbance from them. SeaView golf course is a five minute stroll away, and the train station, on the main Perth to Fremantle line, is just a mere two min walk away.....Or you can drive to Fremantle in approx. 5-8 minutes, to Claremont in 10 minutes, or in about 20 minutes be in Perth City. An undercover parking bay is provided for your convenience. 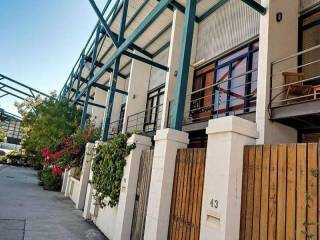 Our tastefully refurbished and spotlessly clean apartment, will ensure you of a thoroughly relaxing and comfortable stay on Perth's Sunset Coast . Swimming, surfing, kite surfing, wind surfing, fishing, boating, yachting, golfing, wining and dining, Cottesloe has it all.... and with a beautiful sunset to enjoy every night too! But dont take our word for it, make sure you read what some of our recent guests have had to say about Westward Ocean View, in the online guest book. So, for your perfect Cottesloe beachside holiday, it's starts here. 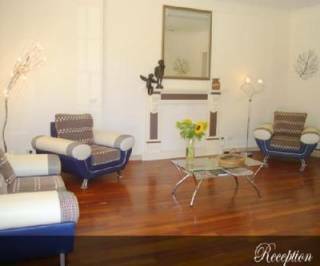 PLEASE NOTE: This apartment is ideal and very comfortable for two adults or two adults and up to two children. Or even 3 adults. However, if enquiring or booking for 4 adults, please do bear in mind that the second bedroom has two single beds, and also there is only the one bathroom in the apartment. 3 or 4 night bookings that take in a weekend, a $50 surcharge may apply. During School holidays, there is a 7 night minimum booking, unless it's a 'fill-in' booking between other bookings. It is an easy and pleasant 8 to 10 minute stroll up the coastal foreshore path, to the main beach side hotels, cafes, restaurants and shopping. Close enough for convenience, but far enough away from these amenities so as not to be disturbed by any noise, particularly at night! This train-line services the western and south western coastal areas of Perth, including some of Perth's popular beaches. The frequent modern electric trains run between the Perth city centre and end at the coastal city of Fremantle. You can have a fun night out without worrying about who's going to do the driving, by leaving the car in the carport and catching the train to Fremantle. Enjoy a meal and a bottle of wine (or two) at one of Freo's many restaurants and afterwards have a drink at one of Freo's famous pubs. Then catch the train home, where you can be back in the comfort of your cozy apartment in less than 10 minutes. ( 6 minutes by train, 2 minute walk) ... and on a Friday and Saturday night, trains run right up till 2:30 in the morning. The airports, both domestic and international, are approx. 35 to 45 minutes away by road, but allow slightly more at at peak periods. A private undercover car parking bay is provided for your convenience. Overseas Visitors, especially from USA/Canada please note. We have a pre-paid mobile Samsung ANDROID phone, with a local sim card for your FREE use, should you wish to use it while staying at Westward Ocean View. All it will cost you is the TELSTRA recharge fee for whatever amount suits your needs. (you recharge the phone yourself from any convenience store, supermarket etc) Just let us know any-time prior to your arrival if you need it, and we will supply you with the number in advance, so that you can inform friends and family of how to contact you. Only the guests nominated and agreed in the Booking may stay in the Property over night. If any other guests stay, extra charges may apply or the agreement may be terminated without refund. The apartment will not be let to any person/persons under the age of 26 without first getting written approval from the owners. Disturbance to our neighbours, including excessive noise, is prohibited and may result in termination and eviction without refund and extra charges may be made for security and other expenses. Before departure, all food must be removed from fridges, all rubbish put in the appropriate rubbish bins provided in the undercroft, and crockery and cutlery washed and packed away. The Property must be left in a clean and tidy condition. All furniture and furnishings must be left in the position they were in when you arrived. Extra cleaning charges may be incurred for the cleaning of dirty dishes, washing machine, dishwasher, emptying the fridge, removal of excessive rubbish, cleaning the bbq etc. Damage, Breakages, Theft and Loss are the tenants responsibility during their stay. The owners take no responsibility for the tenant’s personal property. Smoking is not permitted in the Apartment or the balcony. If it is determined that you or your guests have smoked in the apartment additional charges may be applied. Professional air purification services are required to return the unit to it's original NON SMOKING status. The cost for these services is substantial and can be up to $200. Pets are not allowed in the apartment under any circumstances. INTERNET. Complimentary wireless Internet access via a Telstra wifi device is provided. ( for one device at a time). There is a 125mb per day (accumulative) allowance for up/downloads, which is more than ample for emails, general web-browsing etc, but is not intended for use to download movies, music or large files. Usage in excess of the allowance may be charged for at current Telstra rates. In the case of any problem or complaint, you must inform us at the earliest opportunity so we have the chance to rectify the situation as quickly and efficiently as possible. You must allow repair/service access to the property during reasonable hours should this be neccesary. Deposit of 33% non refundable is required to secure the booking. Payment of the rental deposit constitutes the clients acceptance of these Terms and Conditions. Balance of the rental amount must be received in full 21 days prior to occupancy. If not, the owner has the right to cancel the booking and attempt to re let it. The owners will make every effort to ensure the property is available as booked. However, if the Property becomes unavailable for your occupancy due to unforeseen circumstances (eg. fire, storm, damage, etc) then we will inform you immediately and endeavour to obtain suitable alternative accommodation for your occupancy; failing which any moneys paid will be refunded in full. You must notify us of your expected arrival time and also a mobile contact number at least 14 days before arrival. Arrival- The usual time that the apartment is ready for your use is from 3pm on day of arrival. If no guests are departing that same morning, it is usually possible to move in earlier than this, by request to owner. Check-out time is 10am by the latest, to allow time to prepare and clean the property for next guests. If no guests are arriving that day, a later checkout can be arranged with owner. * A Bond of $300 will be taken, on arrival, in the form of a separate Credit Card guarantee, for which authorisation is obtained, but the card is not charged. ( using the card used for payment) This 'Credit Card Bond' will be refunded in full on departure, ( by simply cancelling the credit card authorisation ) subject to the above conditions being met. It is designed to cover any additional costs incurred including but not limited to, any breakage, damage or excess cleaning requirements, extra guests beyond those declared ..etc. Directions on how to get to the apartment will be given after booking is made.